With its wind farm completed, EDF Renewable Energy is now working on ramping up the solar portion of what will be one of the largest solar/wind hybrid projects in the U.S.—the 140 MW Pacific Wind and 143 MW Catalina Solar projects. There are some things that just go together naturally—John and Yoko, wine and cheese, peanut butter and jelly. Now it's time to add another to the list—wind and solar. EDF Renewable Energy has constructed one of the largest solar/wind hybrid projects in the U.S. The 140 MW Pacific Wind and 143 MW Catalina Solar projects located in Southern California's Kern County were developed and contracted independently; however, their close geographic proximity allowed the projects to share certain infrastructure and evolve into a massive wind/solar hybrid project. Currently, the Pacific Wind project is in commercial operation, and the Catalina Solar project is under construction, expected to come online in June 2013. The Pacific Wind project began long before the Catalina project. In fact, it had been in development for almost eight years and was initially delayed due to unavailability of transmission says Mark Tholke, vice-president of EDF Renewable Energy's West Region. "What enabled Pacific Wind, as well as the Catalina Solar Project, to be built was the construction of the Tehachapi Renewable Transmission Project, a $1.8 billion project that was backstopped by the State of California." For EDF RE, the biggest challenge with the Pacific Wind project was the sheer volume of landowners. The project had more than 230 individual parcels, and many of those parcels were owned by more than one individual, requiring an intensive amount of title work and land documentation. Once the land issues were addressed, construction was smooth. EDF RE used 70 REpower MM92 2.05 MW turbines and estimates that the turbines produce enough energy to power more than 40,000 homes. Located on 1,100 acres of privately owned land southwest of the Tehachapi and Piute mountains, the thin film photovoltaic solar panel project has been under construction since May. It ramped up in December and will reach full capacity in the middle of this year, providing enough clean energy to San Diego Gas & Electric Company to power the equivalent of 35,000 homes a year. Tholke says the challenge with Catalina was also at the development phase, which had to be accelerated to meet the needs of the investor-owned utility. To fulfill obligations under the California RPS, SDG&E required the facility to generate 50 MW before the end of 2012. "California has a mandate that 33 percent of its power must come from renewable energy by 2020, with compliance steps along the way. The first compliance period ended in 2012," says Tholke. After extensive testing, EDF RE chose two types of fixed tilt photovoltaic modules for the project—82 MW of Solar Frontier CIGS and 61 MW of First Solar CdTe—as well as SMA inverters. The biggest challenge with the Pacific Wind project was the sheer volume of landowners. The project had more than 230 individual parcels, and many of those parcels were owned by more than one individual, requiring an intensive amount of title work and land documentation..
For both projects, developing and permitting required a great deal of patience and due diligence. One of the benefits of the hybrid approach was that some of the permitting and development work could be shared. "California is more challenging than other states for two reasons," explains Tholke. "First, the regulatory climate in California is more difficult in terms of certain environmental laws—in particular, the California Environmental Quality act that requires strict documentation associated with the permit. Second, California has a large number of endangered species due to the varied geography in the state. California has more native species than any other state except Hawaii. Federal laws need to be navigated." EDF RE had to avoid certain flora such as Joshua trees, Bakersfield cactus, and other plants with special status. There were also various animals and birds that had to be taken into consideration. "Developing an energy project in California is not for the faint of heart," says Tholke. Another unique aspect was working around the California Aqueduct, which serves lower Los Angeles. "The Pacific Wind project actually straddles the California Aqueduct," says Tholke. "We had to cross the California Aqueduct with the generation tie line for the Catalina Solar project. We had to be able to cross the aqueduct, while protecting the aqueduct during construction." Pacific Wind and Catalina are able to take advantage of some shared infrastructure as well. "The two projects share mitigation land and certain infrastructure facilities, and that's why we're calling it a wind-solar hybrid," says Tholke. "It wasn't initially designed as a hybrid project, but as we were moving forward with Pacific Wind and starting to move forward with Catalina Solar, we saw there were certain benefits to each project to have them develop in tandem." Though the two share some infrastructure, they don't share power purchase agreements (PPAs). "Electricty from both projects will be de-livered to the grid for the benefit of San Diego Gas & Electric, but they are separate PPAs," explains Tholke. "The interconnection agreement is also separate for the two projects. We are in the process of developing additional wind-solar hybrid projects that are envisioned as wind-solar hybrid projects from the beginning, and in that way, we can capture more of the efficiencies in terms of permitting and various types of infrastructure." Tholke wants to be clear, though, that this and future projects are not facilities where solar is interspersed with the wind projects. "We're not yet at the point where we have solar panels interspersed within the wind projects, but that may be the next evolution in the wind-solar hybrid." One of the things that made the wind/solar hybrid particularly attractive in the Antelope Valley area was that the sun shines during the day, but the winds often blow in the evening. In addition, the wind is usually less strong on hot summer days when solar is at its peak. "The two technologies really complement each other in terms of production and the hours of production. It just takes us one step closer to renewable energy as a baseload source of power," says Tholke. "Of course, you've got two intermittent resources. Each facility will produce a smaller amount of energy during periods when the other facility is producing at nameplate, thus the two facilities will maximize use of the transmission lines. It's a ratepayer benefit because it ensures that the transmission infrastructure that has been built for these renewable energy resources is used at its maximum potential." In short, the two technologies complement each other in a way that benefits both the grid operators and the ratepayer. As with many projects like this, EDF RE made some deep dives to find local resources during the construction. At the peak of construction on the Catalina project, they had about 500 workers on site and around 50 percent of that workforce came from Kern County. 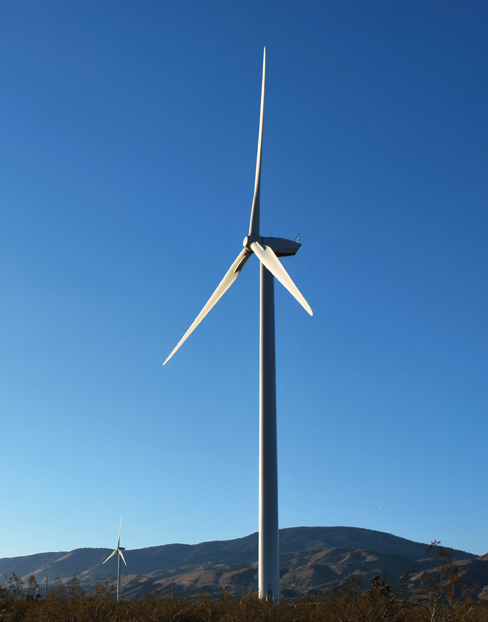 During the development and construction phase of Pacific Wind, approximately $159 million was pumped in to businesses, local government, and households. It's not just about jobs. The two projects will bring tax revenues into a county that has been traditionally an oil and agriculture economy. In Kern County, wind has outpaced agriculture and is now second only to the oil industry. 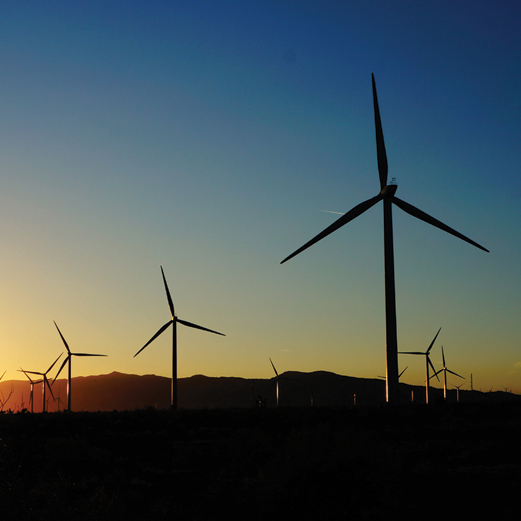 "It's contributing $61 million to the general Kern County budget, which enables a whole host of county services that are really being supported by wind," says Tholke. EDF RE also supported at the community level too. As part of EDF RE's workforce development and community investment program, the company presented a $30,000 check to Rosamond High School for the purchase and installation of a solar-powered baseball field scoreboard. The company also contributed $160,000 to the Clean Energy Training Program at Kern Community College District. Tholke says the next hybrids will go more smoothly, in part, because projects can be envisioned as hybrids early on in the process. Of course, there will still be hurdles to jump if they are to gain traction. "New concepts can be difficult because they're different," says Tholke. "To my knowledge, no utility has signed a power purchase agreement that is for a hybrid project. The value proposition of a wind/solar hybrid project would need to be articulated to the utilities, which I believe won't be that difficult, but it still needs to be done." In the meantime, EDF RE is busy installing projects nationwide. In 2012, the company worked on 15 projects throughout North America that represent over 1,000 megawatts. Tholke says Pacific Wind and Catalina Solar are the direct result of California's renewable energy mandate, as well as the federal Production Tax Credit and the Investment Tax Credit. "The PTC for wind, and more recently the ITC for solar, assist renewable resources in leveling the playing field against fossil fuels, which have decades of government incentives behind them," said Tholke. "These tax credits have created a substantial domestic wind industry, tens of thousands of American jobs, and millions of dollars in local economic benefits for the communities where renewable energy projects exist." With luck, future tax credits will spur more successful hybrids, because let's face it, wind and solar go together like bees and honey, the moon and the stars... you get the idea.